This week we have something a little different. 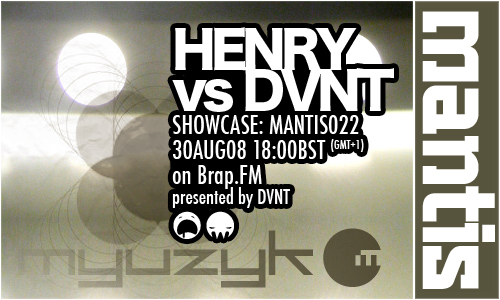 Live from Mantis Radio HQ we welcome Henry, good friend, Myuzyk net label owner and all round musical muse. Henry became obsessed with music from a young age as a listener and developed a taste for electro and hip hop in the mid 80s and in the early 90s was all about acid, techno and indie. With the mid 90s began his love affair with electronica and what was then described as trip hop. Around 1998 he met a new group of friends having moved to a different town, they were still throwing not quite legal parties and had been since the CJB days … He got involved gradually and was part of an alliance known as skinchimney which went on to host parties and club nights around North Kent. Eventually the move from just being a music fan to becoming a DJ happened and the 1210s became the new toy. Playing a mixture of downtempo and electro tinged breakbeat at a night he hosted with a friend which saw some full tilt partying and guests such as SOTEG, Stormfield, Distance, Steelzawheelz and many more. When the time came to move on from this small but much loved label he decided to go it alone and founded an internet based outlet called myuzyk (fast becoming one of THE net labels, every release is frankly, awesome). Since Mantis’ inception on Brap FM‘s airwaves we’ve been pushing the myuzyk sound and releases and shall continue to do so as long as the excellent music keeps flowing. So I’ve temped Henry out of deepest darkest Kent into South London and get him round the Mantis HQ. Rather than the usual showcase, we did a kinda back to back session. Each playing stuff pushing all the right buttons at the moment. As is the norm with Mantis, the range of sounds is all over shop, but the textures and tastes are of a deep musicalness, a clear sigh of artists and producers who are masters of their craft.